In 2011, Kathryn Cowdrick celebrated her 30th year as a performer as she took on the role of Despina in Così fan tutte for Opera Saratoga, the very first role she ever sang. Performances during the following seasons included Marcellina in Ft. Worth Opera’s Le nozze di Figaro, Madame Halitiere for Kentucky Opera’s Cendrillon, Suzuki in Madama Butterfly for the Sugar Creek Festival and Opera Southwest, Julia Child in Bon Appétit and Meg Page in Falstaff for Mercury Opera. She sang the title role of Orfeo for Memphis Opera, Katisha for Opera New Jersey’s The Mikado, Ruth in Pirates of Penzance for Chautauqua Opera, the Witch in Hansel and Gretel for Augusta Opera, and Mrs. Lovett in Sweeney Todd for the Princeton Festival – a role she repeated for Augusta Opera. She began her career when awarded an Adler Fellowship with the San Francisco Opera and went on to appear in many roles with the company, including Meg Page in Falstaff, Paulina in Pique Dame, Siebel in Faust, and in their productions of Die Walküre, Die Zauberflöte, Il ritorno di Ulysse, La traviata, Adriana Lecouvrer, Romeo et Juliette, Manon, Der Rosenkavalier, Il turco in Italia, and The Medium. She was well known for her elegant portrayals of Rossini heroines, and made her European debut at the Netherlands Opera as Rosina in Dario Fo’s controversial production of Il Barbiere di Siviglia. She went on to sing Rosina and the title roles in both L’Italiana Algeri, La Cenerentola, and Le comte Ory for companies including Scottish Opera, San Francisco Opera’s tour, the Merola program, Vancouver Opera, Cologne Opera, L’Opera de Marseilles, Chautauqua, Kentucky Opera, Utah Opera, Koln, San Francisco Opera, and the National Arts Center in Ottawa, Opera Memphis, and New York City Opera. 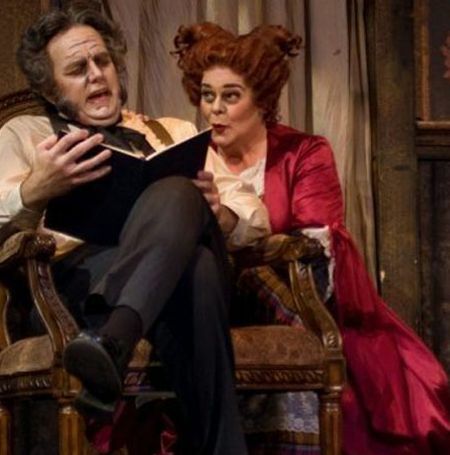 Other international and regional opera appearances have included Meg Page (Merry Wives of Windsor) for Washington National Opera, Niklausse (Les Contes d’Hoffman) and Smeton (Anna Bolena) for Virginia Opera, and Lyon, Balkis (Return to Mecca) for Wexford Festival Ireland, Mrs. Lovett (Sweeney Todd) for Augusta Opera, the Marquise (The Daughter of the Regiment) for Kentucky Opera, Arizona Opera and Lake George Opera, the Old Woman (Candide) for Lake George Opera, Madame Larina and Filipevna (Eugene Onegin) for Tulsa Opera, Arizona Opera and Kentucky Opera, Augusta Tabor (The Ballad of Baby Doe) for Augusta Opera, Elizabeth Proctor (The Crucible) for Tulsa Opera, Aunt March (Little Women) for Fort Worth Opera, Dorabella (Così fan tutte) for the Wildwood Festival and Los Angeles Opera, Countess (A Little Night Music) for Wildwood Festival, Meg Page (Falstaff) with Opera Illinois, and Varvara (Katya Kabanova) for Los Angeles Opera and the Foreign Singer (Postcard from Morocco) for Opera Festival of NJ. In addition to her teaching duties at the Eastman School of Music, she continues to be in demand as one of today’s foremost singing actresses. Since beginning her teaching career there, she has appeared in over 40 regional opera performances which include the title role in The Medium with students in the Eastman Opera Theatre and in productions of The Mikado for New York City Opera, Dialogue of the Carmelites for Arizona Opera, Marcellina in Le nozze di Figaro for Opera Omaha, Arizona Opera and Utah Opera, the Witch in Hansel and Gretel for Augusta Opera, Berta for New York City Opera, Tulsa Opera and Florentine Opera’s Il Barbiere di Siviglia, Ruth in The Pirates of Penzance for Lake George and Fort Worth Operas, the Marquise in Le fille du Regiment for Kentucky Opera, Arizona Opera, and Lake George Opera, Il Matrimonio Segreto, Gianni Schicchi/Buoso’s Ghost for Lake George Opera, Madama Butterfly for Artpark and Mercury Opera Rochester, Zita in Gianni Schicchi/Buoso’s Ghost and Mrs. Gibbs in the professional premiere of Our Town by Ned Rorem at Lake George Opera Saratoga. Cowdrick can be heard as Charmian on the New World Record’s 1984 Grammy Award winning recording of Barber’s Antony and Cleopatra, recorded live at the Spoleto Festival where she also appeared in Ken Russell’s televised production of Madama Butterfly. She performed Karolka in Jenufa with the Opera Orchestra of New York starring Leonie Rysanek, which was recorded live from Carnegie Hall on Grammaphone Bis. She is featured on the Eastman Opera Theatre recording of Bon Appetit/This is the Rill as Julia Child. This operatic monologue by Lee Hoiby and Julia Child was released by Albany Records. She also performed the piece for Julia Child’s induction into the National Women’s Hall of Fame in 2007. A native of Allentown, Pennsylvania, she is a graduate of Penn State and of Columbia University with a masters degree in Speech and Voice Pathology. She was a member of the Opera Center at the Juilliard School. She has been on the faculty of the Eastman School of Music since 2002, teaching studio voice and vocal pedagogy. She is a well-respected masterclass clinician for Young Artist programs for lectures on vocal health and longevity. She is the President of the Central NY Finger Lakes chapter of NATS and resides in Rochester, NY with her husband tenor Robert Swensen. Her son Matthew Swensen is a member of the ensemble at Opera Frankfurt in Frankfurt, Germany.